This morning I awoke to the sound of lots of swallows getting ready at dawn for the day’s insect catching action. I had slept with the windows open (Chalet Fleuri is a two-star hotel, no air conditioning) – so all the birds were up early and I decided to join them. Dawn in Chauvigny is beautiful – the sun rises over the medieval part of the town and I was treated to a wonderful silhouette. It was very peaceful and I sat and enjoyed the sun rise. It was 5.30 am and after dawn I decided to go back to bed for a couple of hours – no use trying to check out at that time, or starting a noisy Harley to wake everybody else who did not hear the swallows. 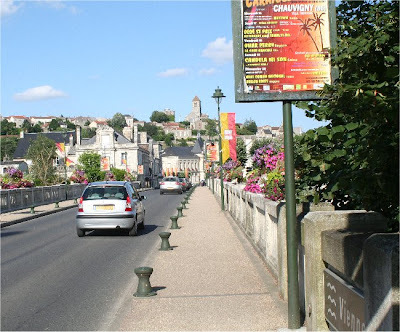 The picture below shows the centre of Chauvigny with the bridge over the river Viennes, note Claire driving past in her silver Citroen C3! After leaving the hotel, I went down to the town square hoping for a coffee. No Starbucks here, but the place I stopped at only served pizza – I decided to move on. The bike took ages to start (much to the amusement of the watching locals), and this worried me a bit. I stopped off at the Gendarmerie at the edge of town to report my missing passport. The Gendarme did not speak English and I was very proud of myself that I could converse with him in French. I got a report of the missing passport which I need to get out of the country and for getting a new one. The bike started first time after this and I decided to move on. I had a breakfast of delicious black coffee and two croissants at a roadside café. Exactly as you would get in Ireland, but it tasted so much nicer in France. Once again the bike started OK so I continued my journey in more confidence. The first part was through smaller roads from Chauvigny to Limoges. Lovely countryside with the smell of freshly mown hay everywhere. Weather was excellent – no more rain, I had blue skies for the rest of the day. Due to starter problems and time in the Gendarmerie I was a bit behind schedule – I had planned to meet Roma and the girls at Carcassonne airport at 3.10pm so once I hit the autoroute I moved at a much faster pace (80mph/130kph). There are a lot of cars on the road, so much so that it seems as if every French person has 4 or 5 cars. There are Citroens, Peugeots, and Renaults everywhere – very patriotic of the French to buy their own cars. I kept seeing Claire’s silver Citroen C3 everywhere – I even waved to her a few times, but she never waved back! At a services station after getting petrol I had problems starting again – really bad this time, but eventually the bike started. I decided not to go for something to eat, but to keep going. Close to Carcassonne a Ryanair jet flew over the autoroute – it was about 3.00pm, right on time. I got to the arrivals hall literally two minutes ahead of Roma and the girls – excellent time-keeping by my part, I get this from my Dad. Carcassonne is a really small airport so in no time at all the bags were picked up. We were getting a rented car from Hertz – but so was everybody else on the plane. The queue was long and the wait even longer. It was an hour after landing that we finally got the car, 45 minutes of this was at the Hertz office – they were painfully slow. How they could not be more efficient I do not know, surely it is possible to have some preparation done ahead as they only have a few flights a day at the airport – I will use this as an example in my next Business Systems Analysis class. Anyway – great to see Roma and the girls after two day’s away. We set off for Sigean about 80km away – me leading the way on the bike (started again OK) and Roma following in our Opel Zafira rental. The villa is lovely and we met the owner who showed us around. Finally, we got into the pool and felt that we had arrived and were on holiday at last. I was pleased that my trip on the bike had gone according to plan. However, later when I wanted to move the bike from the front to the back of the villa it would not start at all – I feel certain that the starter motor has had it (this is the third time since I bought the bike). I now have no choice but to call HOG Assistance – but since it is now Saturday evening I will wait until Tuesday before doing anything further (most Harley shops close on Mondays). At least I got here! We had pizza for dinner in a pizzeria – €60 for delicious pizza and drinks for five. Good value. All to bed exhausted after all the travel.